Rob Gilhooly soaks up the atmosphere at what is thought to be Japan's oldest spa resort, Dogo Onsen in Matsuyama, Ehime Prefecture. Lazing in the soothing waters of Dogo Onsen, you immediately come face to face with the Gods. Chiseled into the cylindrical Aji stone tank that feeds the aptly named "God's Water" bath, a benevolent-looking deity named Okuninushi-no-mikoto bathes a sick Sukunahiko-no-mikoto in Dogo's waters. According to tradition, the latter makes a miraculous recovery, performing a dance on a rock to prove it. The healing powers of Dogo's waters are legendary, enticing not just ailing Gods but also emperors, princes and feudal lords, not to mention a lame white heron—the subject of another miracle-cure myth. "It is said that stories of the heron triggered the establishment of the first community here about 3,000 years ago," says Motoki Komoda of the Matsuyama City-run spa, adding that the bath house is also mentioned in the Kojiki, Japan's earliest historical record, which dates back to the early eighth century. "This makes it Japan's oldest hot spring." 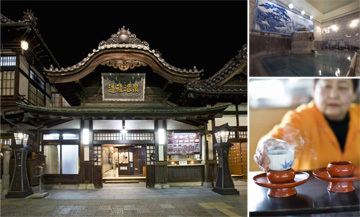 Dogo Onsen has existed as a physical spa facility from about 700 years ago, Komoda said. The central part of the current premises—known as the "honkan," or main hall—was opened in 1894, he added. It is a majestic huddle of structures whose criss-cross of angular roofs, ornately decorated with gargoyle-like tiles and crowned with a red-glass tower (housing the tokidaiko clock drum), give it a temple-meets-fairy-tale-castle appearance. Inside, old black-and-white photos and a series of amusing bathing etiquette cartoons adorn the cedar-wood walls. A maze of narrow corridors and steep staircases, which connect the various annexes that were built as Dogo's popularity spread, are like something out of an M.C. Escher lithograph. The bathing experience is also slightly Escheresque. There are four courses available, each distinguished by color-coded lines running around the building like a subway map. The most popular of these is the "Kami-no-yu Ni-kai" (blue course). Having climbed up the steep staircase to the spacious second floor resting space, you change into a yukata robe and descend via another set of steps to the bathing area. Back on the upper floor you are offered snacks and tea, which is served in cups balanced atop saucer-shaped red lacquer trays, just as they have been for over a century. Another tradition that continues is the beating of the clock drum, performed three times a day in the tower, a heron-topped extension to the building that initially was little more than a folly. The "Botchan" room, meanwhile, is named after a novel by Natsume Soseki, who once rested in this room after a soak in the baths in 1895. The author was extremely taken with the spa, which was the most imposing building in the area at the time, affording views from this third-floor room to Matsuyama's castle and the mountains beyond. Sadly those views are all but lost today due to high-rise hotels that sprung up around the spa during Japan's post-war economic charge. Yet, its popularity continues, attracting visitors from far and wide. "It has become a popular destination for foreign visitors, especially among Europeans, who appreciate the spa's history," says Komoda, adding that visitors from mainland China, Taiwan and Singapore are also increasing. "Some local voices have said we should do away with the bathing side and turn this into a museum, but visitors come here from far and wide because they can experience something truly unique and largely unchanged for over a century. We hope that will continue for another hundred years." Ehime Prefecture is located in the northwestern part of the island of Shikoku. The manufacturing of paper, pulp and towels prospers in the eastern part of the prefecture, while the southern part is one of the most well-known production grounds of citrus fruit, cultured pearls and red sea bream. Ehime is also known for the many haiku poets who have come from the prefecture. Mizuhiki: Mizuhiki is a craft made by tying, braiding or wrapping colorful decorative cords (mizuhiki), which are themselves made by twisting Japanese paper, into decorative objects. Tai-meshi: One of Ehime's representative dishes. The taimeshi enjoyed in the southern part of the prefecture features hot steamed rice topped with a mixture of thin slices of red sea bream, soy sauce, raw egg, soup stock and other ingredients. Another type of taimeshi is made by steaming rice with red sea bream. Rob Gilhooly drops in on two historic washi paper making establishments in Echizen, Fukui Prefecture. Inside the stark, chilly workshop, the four artisans conduct their work in almost total silence. Barely a word is spoken as the rhythmic clitter-clatter, swish-splash of the huge suspended frame they operate is rocked back and forth between them like a giant swing and dipped into a rectangular vat filled with a viscous milky-colored liquid. As if by magic, within minutes a glistening membrane-like substance appears on the surface and the foursome brings the frame to an abrupt halt. With the help of a winching device the fruit of their labors is carefully transferred to a growing stack of other membranes. What at this stage look like large, wafer thin slices of tofu will eventually emerge from the drying rooms at Iwano Heizaburo Seishisho as sheets of washi paper made in a process that dates back over 1,500 years. The workshop is located in Echizen, Fukui Prefecture, which is known as the oldest washi production center in Japan. According to tradition, a female kami (god) taught the local people the art of paper making. Craftsmen and residents alike greatly revere the kami, a Japanese homophone that can mean both "paper" and "god," and hold an annual festival dating back 1,300 years to pay their respects. "The kami gives craftsmen a sense of moral support and comfort," says Sugihara Washipaper, Inc. President Yoshinao Sugihara, whose company has a history in the Echizen washi industry dating back over 500 years. "For generations it has been thought that they can communicate with the kami (god) through kami (paper). They treat both with extreme reverence, which is why you will rarely see us idly throwing away paper or treading on it." Echizen washi is made from the bark of paper mulberry, mitsumata shrubs or the gampi tree, which often are mixed with a mucilaginous substance known as "neri" that is made from the mashed root of the tororo-aoi plant. Artisans fix the mixture on frames to make hand-made paper of varying sizes for diverse uses, from fusuma sliding doors and shoji paper window screens to writing paper and woodblock printing. The most prized type of washi is "hosho," which was traditionally used for writing official documents and was prevalent until the introduction of Western paper-making techniques around 140 years ago. Today Heizaburo Iwano is one of just a handful of craftsmen making the high-grade paper, though mostly for use in fine art such as Japanese-style painting and ink-wash painting. His company has been operating for over 140 years and the great Nihonga artist Yokoyama Taikan is numbered among his illustrious clients. "It is impossible to reproduce by machine the soft feel of washi," says Iwano, 82, whose workshop is well known for the large sheets of paper first made on request by Yokoyama. "Even if you machine manufactured washi paper to the same thickness it would have a different character and weigh more than double that made by hand." Lightness is a characteristic of Echizen washi—but so too is its durability, a result of the paper's long fibers, says Sugihara. Its variety of applications also distinguishes it from other papers, he adds. "Whereas Western paper has a lifespan of 100 to 200 years, washi documents stored in Nara's Todai-ji temple have survived from over 1,300 years ago." Ironically it was Western paper that triggered a severe decline in demand for washi—a trend that continues to this day. Sugihara has attempted to buck that trend by introducing innovative ways for using washi, such as in textiles and smaller products suited to modern lifestyles. In recent years he has also started to export paper made by Echizen craftsmen. Huge washi textiles with stunning designs can be found in buildings including the Grand Hyatt in Tokyo's Roppongi district and recently in a window display of the Paris perfume house Guerlain. Sugihara meanwhile has joined forces with a German designer to create a stunning series of lacquer-reinforced products, including cases for business cards, smart phones and tablet computers. "There is an old craftsman's song that basically means you can make washi all your life but never create the perfect paper," Sugihara says. "In Echizen we continue to strive for perfection, but now on a much wider stage." Fukui Prefecture is located on the Sea of Japan side of central Japan. The textile and eyewear industries have prospered in the prefecture. Fukui is also the birthplace of koshihikari rice, which is known for its superb taste, and the prefecture is among the leading rice production grounds in Japan. Echizen soba: Echizen soba noodles with grated daikon radish: This version of soba noodles features soba that is a bit darker in color than the usual style, topped with soup stock and ample grated daikon radish. The simple way of enjoying soba allows the flavor of high-quality soba grain to be savored. Tojinbo: This precipitous cliff stretches about one kilometer along the coast, and since ancient times has been known for its superb landscape. It is a dynamic sight to see the rocks rising above the sea surface for about 25 meters being washed by the rough waves of the Sea of Japan.